Much like at Mike Scioscia's Tragic Illness, Hack-a-Shaq will have end of the year reviews. Same rules apply as grades are handed out according to pre-season expectations vs. actual production. 2012-2013 in brief: Coming off one of his least productive seasons, Steve Blake was not exactly a fan favorite after missing a go-ahead basket against the Thunder in the playoffs the year before. Fell to injury soon after taking over the starting role for injured Steve Nash. Had one of his most productive seasons in his career upon return before ending the season injured. 2014 status: 1 year left on his contract, earning 4 million. 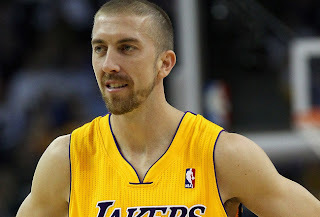 Oh Steve Blake. Why does the common Laker fan dislike you so much? I would have to guess it is because of apparent lack of production since making your way over from Portland, where you would bury the Lakers with three pointers game in and game out. Or missing a wide open go-ahead three pointer during the 2012 playoffs against the Oklahoma City Thunder which resulted in death threats to Blake and his wife on twitter. Laker fans seem to love to hate Blake, as misplaced and misguided as it is, though a lack of production in his two seasons with Los Angeles has put the spot light and blame firmly on him. But you know what? He had a great season for the Lakers, never looking out of place (except for when he was in street clothes) and shooting the lights out from three point range. It didn't matter which one of the three headed coaching monster was in the big chair, Blake produced consistently and was a key component in Los Angeles making the playoffs. When in the Princeton Offense with LA's first head coach of the season, Mike Brown, Blake was cool, composed and helped the team learn an unfamiliar offense, running it to near perfection as he averaged over 4 assists per game off the bench under Mike Brown. After Brown was canned, Bernie Bickerstaff was named head coach until they could sort the mess out. Blake only played two games under Bernie before going down with an abdominal injury that required surgery, leaving the Lakers with the thoroughly awful duo of Chris Duhon and Darius Morris manning the point guard position for quite some time; Blake didn't make his return until the end of January (missing most of November, all of December and most of January) and by that time, the Lakers had already dug themselves into a sizable hole. Upon return, Blake had to adjust to a whole new system with head coach Mike D'Antoni taking over the reigns for the Lakers. Steve did a wonderful job manning the point guard slot under D'Antoni, keeping turnovers and mistakes down to a minimum, while occasionally having a big game scattered around his normal above average games. All this, without mentioning his substantially better defense than Steve Nash, as he was frequently called upon to play heavier minutes against teams with good point guards and try to make their offensive lives miserable. It worked, with a few notable exceptions (Russell Westbrook), while not giving up much offense at all, thanks to Blake's outside stroke and Nash's non-existence within the pick and roll (and Princeton) offense. It was fairly smooth sailing for Blake and the Lakers after his return; for one thing, it meant substantially less playing time for both Duhon and Morris, a more dynamic offense for the bench unit, improving the bench substantially (some of this can be credited to Earl Clark, his review will come later), ultimately helping the Lakers to a 26-12 record since his return. And, of course, the unthinkable happened when Kobe Bryant went down with a serious Achilles injury, leaving the last three minutes of a pivotal game vs. the Golden State Warriors and two more important games vs. the San Antonio Spurs and Houston Rockets up to the Kobe-less Lakers. It seemed the Lakers were destined to miss the playoffs altogether, if not for Steve Blake's heroics, coming up big to end the final three minutes vs. Golden State, surprising nearly everybody by scoring like his fallen teammate and leader in the last two games. During those final three games, Blake averaged 20.3 PPG, 5.3 APG and 5 RPG, while hounding Steph Curry, Tony Parker and Jeremy Lin into having below average games against a team they normally destroy with dribble penetration, thus ensuring the Lakers get post-season basketball. 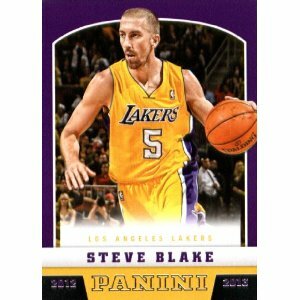 Ultimately, Blake had a big impact on Lakers' basketball, providing a calming presence and quality play in substitution for Steve Nash, either off the bench or starting in place of him (Blake finished with 13 starts on the year). Much like Nash, Blake shot the ball exceptionally well, placing 7th on the Lakers' highest shooting percentage from three point land for a season. In short, Steve Blake redeemed himself for his disappointing seasons with the Lakers and missing the biggest shot of his life, while earning his final season of his contract with the Lakers. And in typical 2013 Lakers (and Dodgers) fashion, Blake went down with a hamstring injury, dooming the Lakers for good against the Spurs, ending the surprisingly good season for Blake as it began: on the injury reserved list.